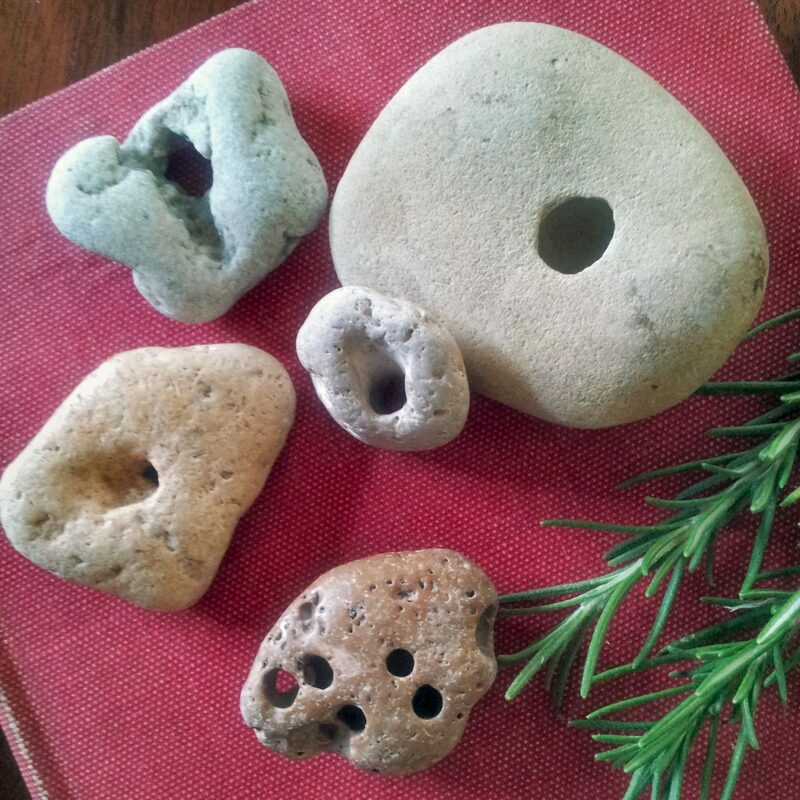 We went to the beach last week and have now listed a number of hagstones in the shop. Hagstones, also called hex stones or holey stones, are stones with naturally occurring holes all the way through them. They are often found in streams and rivers, in the shingle at the seashore, or even in caves where they are formed by the flow of water. In the worldview of Appalachian folk magic, the otherworld is all around us; we exist in a world inhabited by The Good Neighbors and wee folk, ghosts, demons, angels and all manner of spirits. Following in the footsteps of our old world ancestors, Appalachian folk magic practitioners regard boundary sites like caves, lakes, graveyards, and mountain tops to be places where one can come into contact with the world of spirits. Natural openings or doorways are all believed to form the portals between the worlds–of this and the other. This then, is the general magical essence of a hagstone– a door, shaped by the hand of nature, leading to the otherworld. As such, hagstones are used in all manner of charms and magical operations, of which the following are a few examples. Many practitioners utilize hagstones for the blessing of holy water. Because the stones are created when water wears a hole through the stone’s surface over long periods of time, they become infused with the power of water to change and transform. Holed stones are also reflective of the caves and openings in the earth leading to subterranean waters and the deep waters of the underworld. In areas lacking holy wells, water infused with such potency and blessed by the practitioner may be used to great effect in purification and healing spells. Even in Britain where holy wells are present, the taking of holy waters for healing was often coupled with the afflicted person passing through large holed stones or fissures in rock which were located nearby, suggesting a complimentary relationship between the water and the stone. Traditionally, hag stones were hung in stables over the heads of horses as a charm against the horses being ridden by faeries, witches or hags (hence the name hagstone). Horses thus tormented were found sweating in their stalls with their manes tangled and were supposed to be cured by the application of this charm. The stones are hung with iron, essentially locking the gateway to the otherworld and providing protection from malicious spirits. Hagstones were further employed in Dorset and Devon as protection charms on fishing boats against being “witched”, or plagued by evil spirits (who may or may not be under the direction of a witch). This condition would manifest as bad luck, accidents and the inability to catch fish. The protective holey stones were tied either to the start rope, or to nails driven in the bow next to the gunwale, and this practice is documented as occurring well into the mid-1800’s. 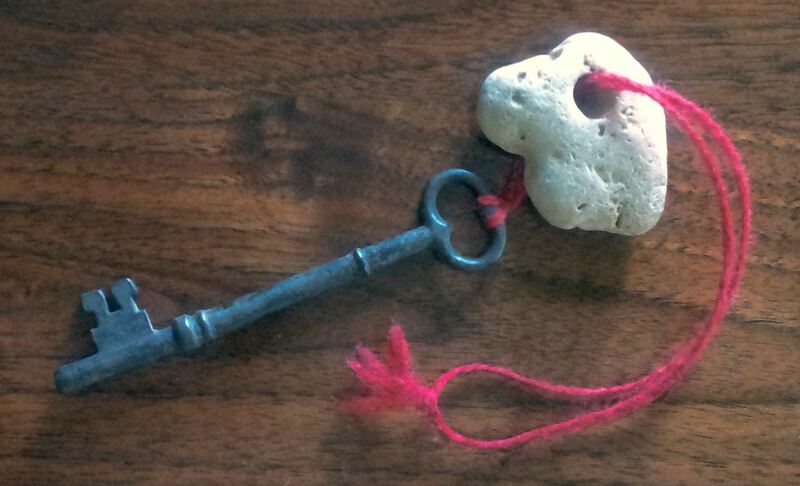 One final traditional protection charm, this time for the home, consisted of hanging a hagstone from the house key, a practice which again combined the otherworldly gateway (the stone) and the potency of iron (keys were once made of iron), effectively sealing out the interference of malevolent or troublesome spirits. This charm was common throughout Britain and they can still be observed hanging in homes in Appalachia. The stone is then held up to the eye and peered through. Leland suggests that the stone may help to focus the psychic eye as a spyglass does to the physical ones.